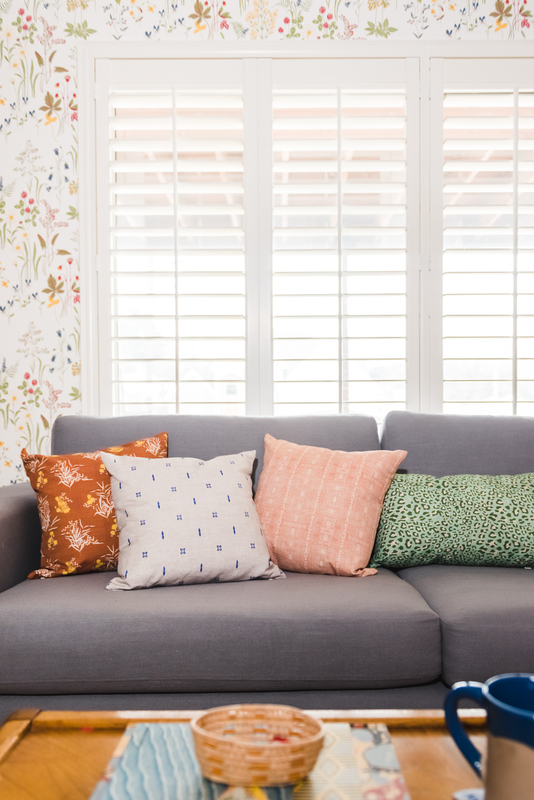 This time around, I was stoked to find out that they had a sister company called Roostery, where they take the designs from Spoonflower Marketplace and turn them into final products. 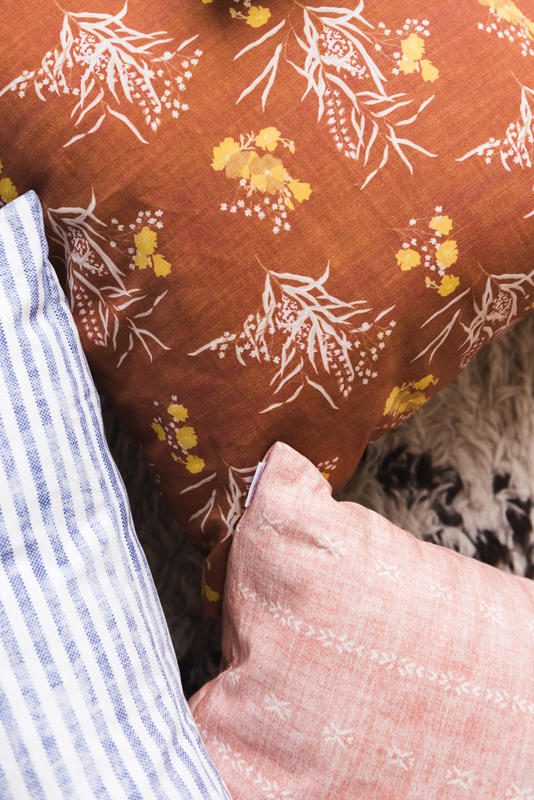 So, if you’re not the DIY type or don’t want to look around for someone to help make them for you, you can still get some beautiful items made with your custom fabric. And it’s all at the click of a button. 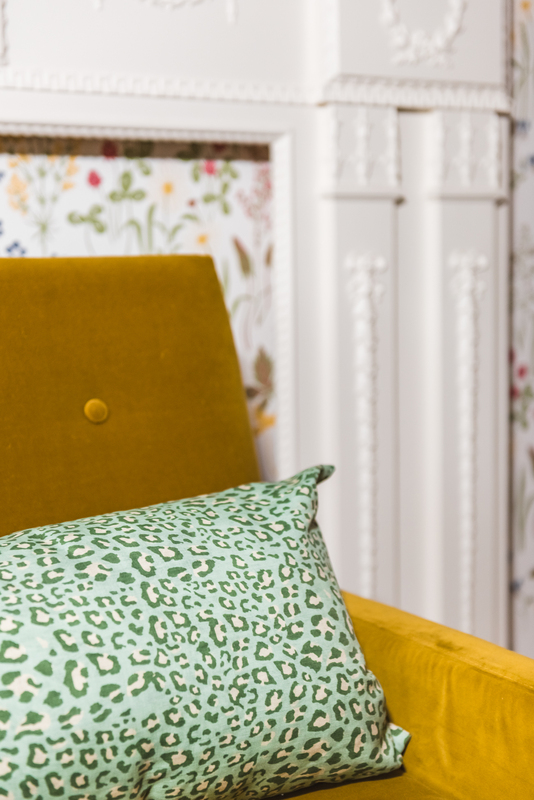 You can get curtains, duvets, pillows, wallpaper, tea towels, napkins…you name it. 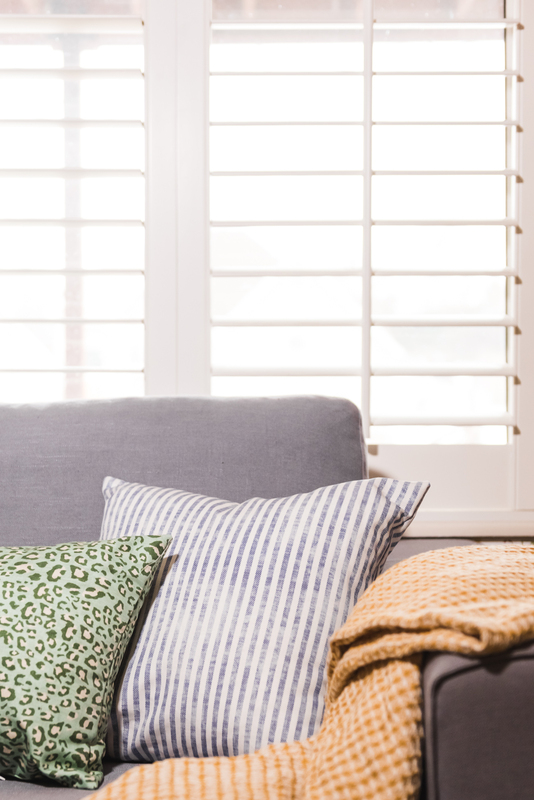 I’ve been wanting to find some throw pillows for my new living room set up (see the reveal here) and I had been looking everywhere for the right thing so when we partnered with Spoonflower, I was so relieved at the chance that I could find something that was juuuust right for the space. I ended up falling in love with the work of Holli Zollinger, who just so happens to be based out of Utah, just like us, and has a very prolific portfolio. 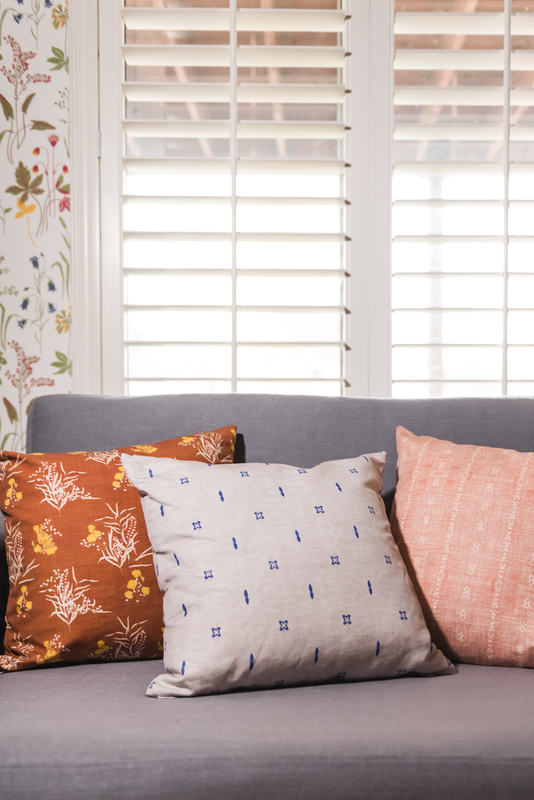 Spoonflower has the option of creating a “collection” of fabrics and I basically gathered 5 pages of stuff I loved from her (I had to narrow down THIS list–ha!). I was going for a Scandinavian, fresh vibe. Her work has a tinge of boho and French too and has lots of texture to it. I decided to go with a green, pink, blue, cream, palette and gathered them all into this collection. The colors are so pretty! I ended up going with a green leopard, called Petra Leopard, because I wanted to get in on the animal print trend, but couldn’t imagine going in the same palette. This one is SO pretty! I got two lumbars for each of my gold chairs. You can find the product options for Petra Leopard on Roostery here. I ordered it in the Linen Cotton Canvas Ultra. I then paired up with Petra Leopard with a classic French blue ticking, which you can see here. I thought it was a nice contrast to the floral of the wallpaper going on in my living room. I had the ticking turned into an 18×18” throw pillow on Roostery. I ordered it in the Linen Cotton Canvas Ultra. Next, I added in a pretty blush pink using Holli’s Playa Tribal stripe in pink. I have another wall in the same area painted pink (unpictured) so it ties that in nicely. I had the blush pink turned into an 18×18” throw pillow on Roostery and ordered it in the Linen Cotton Canvas Ultra. I added in some variety in with this Kalami Bouquet print in mustard. I wanted a floral print that would reflect the wallpaper but also be grounding and this one is so pretty with it. I had this print turned into the Catalan 18×18” throw pillow on Roostery and ordered it in the Linen Cotton Canvas Ultra. In addition to my new custom pillows, which I love, I wanted to tie it in with a DIY lampshade. I fell in love with the Playa raindrops pattern from Holli and it tied in beautifully with my wallpaper–like peas and carrots! I’m stoked with how it turned out. 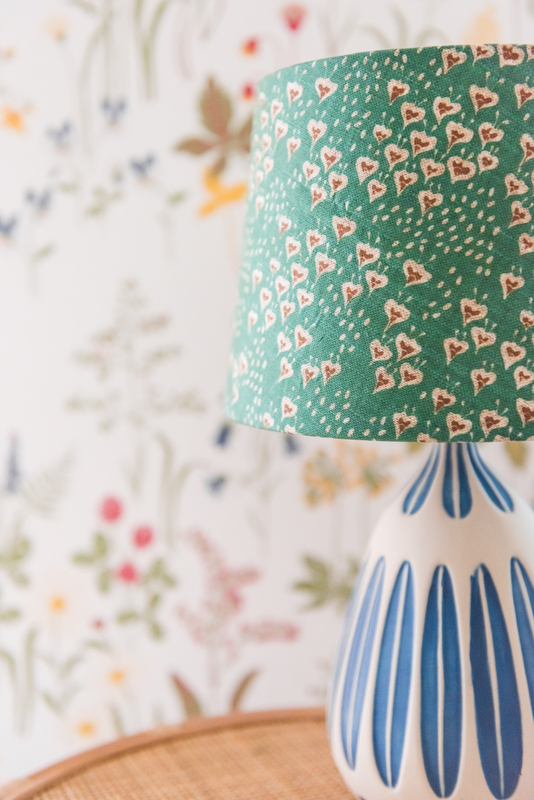 Spoonflower has a tutorial on how to make a lampshade from scratch here using a kit, but I ended up using the plain white lampshade that I already had on my lamp and recovering it. Fabric in your choice (about 1 yard depending on the size of the shade). I ordered it in the cotton poplin so it would be easier to work with. Leave ¾ of an inch on each side of the traced path and cut it out. Follow the instructions on your spray adhesive and spray the area in a well ventilated space. Attach the fabric on one end of the shade around to the end. At the end, fold the fabric over about a ½”, spray the end, and then attach securely. Carefully, fold the fabric around both ends of the lampshade, smoothing out any bubbles. 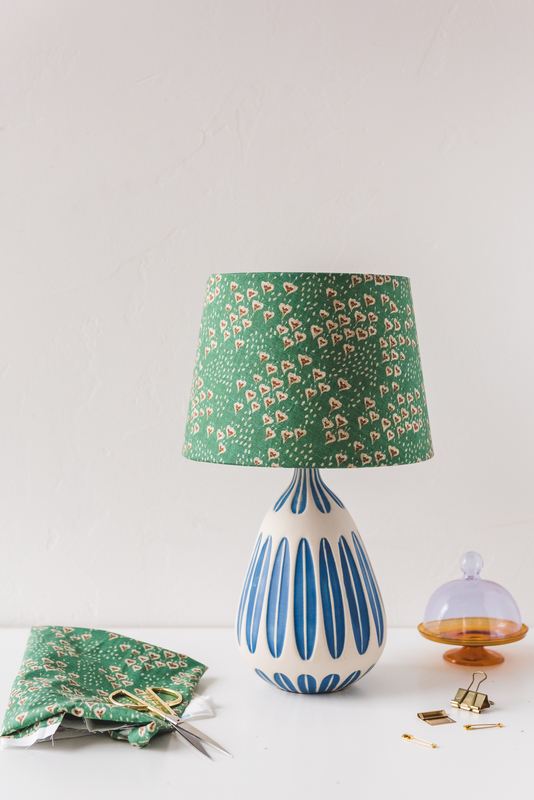 To complete the look, use cotton twilling and glue it on the inside of the lampshade. 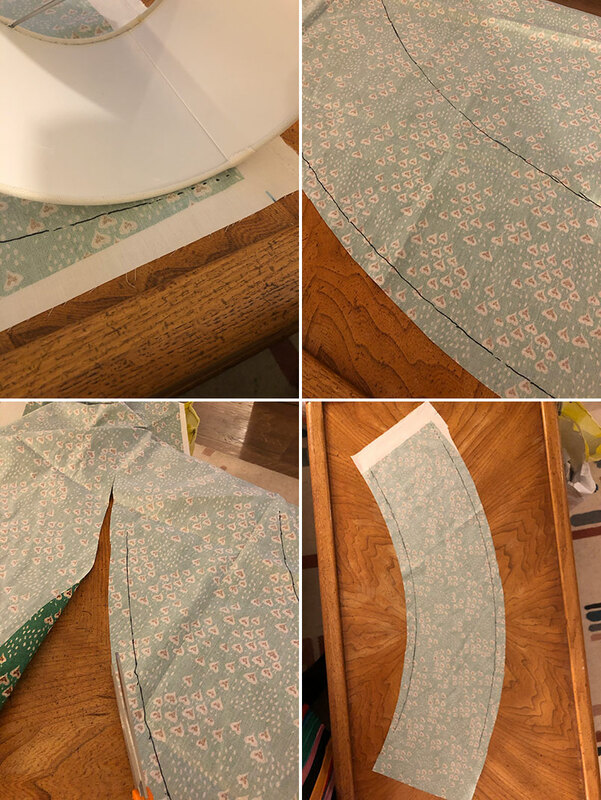 This will help secure the fabric to the shade, while also allowing it to have a clean line once the light bulb is on and you can see everything! I was so stricken with Holli Zollinger’s work, but there really is a pot for every lid out there. Some of my favorite ways to find beautiful work is to search for a style that you’re looking for. I found some stunners searching for “modern farmhouse”. 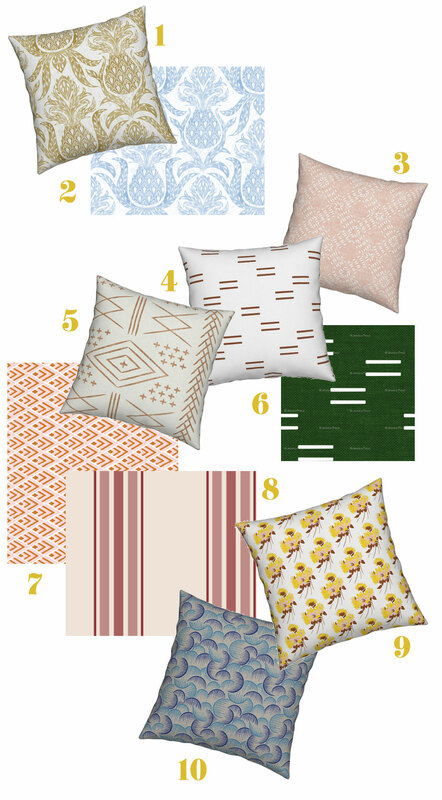 Here are some of my favorite Spoonflower trends going on right now. Have you ever used Spoonflower? I’d love to hear about your experience. I’m pretty over-the-moon to have so many options at my fingertips and I’m looking forward to many more. What projects do you have in the works? Are there any projects you’d love to see from us? 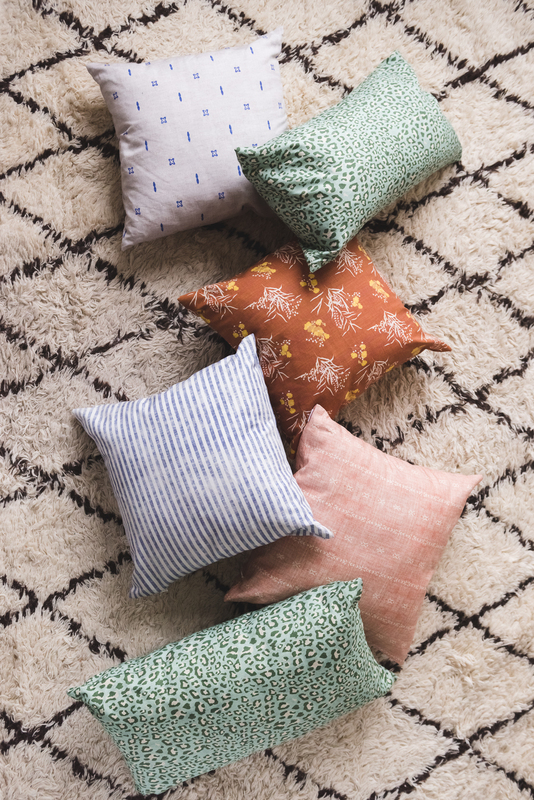 Spoonflower is giving Lars readers 10% off your Spoonflower and Roostery orders with code Lars10 now until March 31, 2019. This post is sponsored by Spoonflower. Thank you to our awesome brands who allow us to create beautiful content for you! Your wallpaper is so pretty! Where did you find it? A note to the folks at Spoonflower – this reads as if it was written by a 12-years-old child. Do you have no proofreaders or editors? 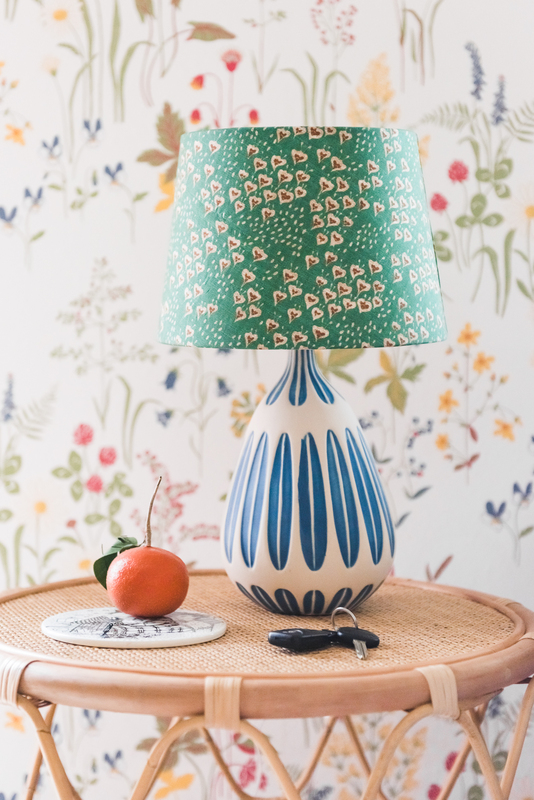 And WHO would put some countrified print with a mid-century lamp? Argh! Take me off your email list, please! Hi Su, thanks for your comment. I’m sorry to hear that you don’t like the combo of the lamp and shade. I love it so much! You are welcome to unsubscribe anytime. Sorry where are the photos with the lampshade tutorial? You mention you used a Sharpie but I don’t see any step by steps, and the link is only for use with the kit. I might be missing something . . .
Ooops, sorry! Yes, I just added it in. Thanks for the check in.